I have to & have to admit this, that I was totally disappointed last night with “Koffee with karan”. I was dying to see Richard Gere on the sofa, but sofa was “gayab” and there was an arm chair, which looked very outdated and uncomfortable to me, not at all impressive. 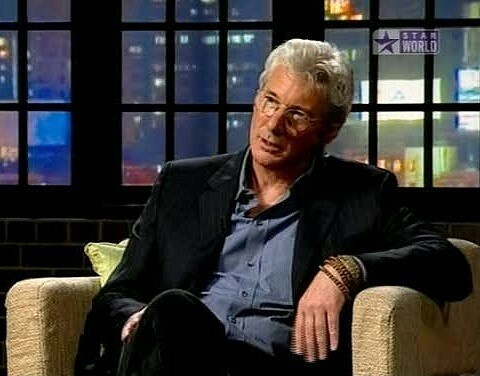 The image I had in mind for Richard Gere on KWK shattered when I saw Gere with those old fashioned glasses (soda glasses) and no dressing sense, I mean the colour of his shirt was pretty dull. Infact Karan was looking quite cool and dashing with pink shirt and white blazer. Half of my excitement died when I saw Gere with stupid dull clothes and glasses, but than I thought may be Karan will make it a big and funny interview and we will get to know about Gere’s personal life and some Hindi “jawabs” for Karan’s questions (Gere is working for India from last 8 years) but not even a word of Hindi. I am sure karan himself was feeling very stupid and pakao, you could easily guess from his face. His head was all the time tilted to one side and no smile whatsoever. Karan must be cursing himself to call Richard Gere so early on the show, I mean he could have waited till the Richard and Shilpa kiss happened, his badluck. The whole episode was about Buddhism, Tibet and Aids, I am not saying that I don’t like all these topics but, “come on yaar” KWK is not about politics and religion. We read all that in newspaper everyday. karan is very cunning, while introducing or you can say showing off acting talents of our super stars to Richard Gere, he was very biased to Amitabh Bachchan (Family ties) and Shahrukh Khan (very good friend) so he showed real good scenes of them and Aamir Khan’s scene was kind of stupid just showing him crying. I was literally yawing and waiting for the show to get over, or I was waiting for the “Rapid fire” round to start. Atlast the fun began and the rapid fire round was really funny and brought me back on my toes with smile on my face. K: The one thing you like about India, the women, the food or the culture? R: The women for sure. K: the one thing you dislike about India, the traffic, the pollution or the population? R: Traffic. Mumbai there’s no way you can live here. K: Name the Indian actress you would like to be cast opposite? R: oh god! There are so many and you will put me in lot of trouble with this. Everyone I meet I would like to work with and I have met 50 to 100 of them. I really want to work with is my “Wife”. Karan: But she is not an Indian Actress. R: Des, des,des (destruction). The greatest disaster perhaps in the American history is his presidency. We never had someone who is so out of touch with reality and so insensitive to the lives of other people or other culture. R: Hussein, sad very sad. How this man be fell from where he was to be in that hole in the ground and found by the enemy soldiers like that. R: He’s a kid and a friend. K: The sexiest women alive, “please don’t say its your wife”. K: The most outraged rumour you heard about yourself in recent times? R: Recent times, “The gerbil”. Karan: oh god, yeah I did hear that, that’s terrible. K: the main stream leading man in Hindi cinema who has Hollywood potential? R: they all have, but I meet the actresses too. We talk about acting, we connect at same level. I would love to be in a Hindi film and dance in a bollywood movie. Karan: you have no idea what you saying. 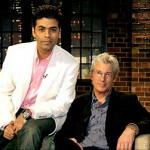 K: If Richard Gere acted in a bollywood film _ _ _ _ _ _? R: If, he would be incredible. Karan: you’ll be Shahrukh Khan? Richard: who’s Shahrukh Khan, I mean theirs Jungez khan, theirs Shahrukh Khan and Richard Gere. K: Pretty woman or Chicago? R: Chicago ofcourse, it’s a better film, but pretty woman has a certain magic voodoo to it. K: Wining a Academic award or a Noble prize? K: Enlightenment or world peace? R: They both go together. K: Abhishek, Shahrukh Khan or Aishwarya globally the most visible person? Richard Gere wins the Koffee Hamper and thanks his mom & dad for being supportive (Just a laugh). Nothing more to say. Basically the Richard Gere episode was total flop. Yeah that interview was really quite boring, and even I felt that Karan was looking distinctively uncomfortable.